Experience the pure magic of visiting Warner Bros. 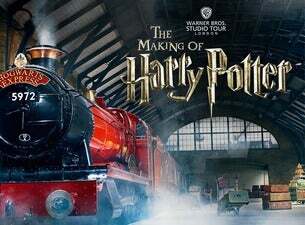 Studio Tour in London with this excellent package that includes return transportation from London’s King’s Cross. With movie props, magnificent sets, chocolate frogs - available from the gift shop - and even the Hogwards express, fans can enjoy an extended visit of 4-hours at the studio and choose a morning or afternoon option. Tickets will be available for pickup from a centrally located meeting point.